FedTech has extensive experience in manufacturing military and defense equipment. Over the years, we have become skilled in military and defense manufacturing as we have the resources, facilities and expertise required to get the job done. We manufacture parts from armor plating for military vehicles such as the hemit vehicle, hummer, M915, and more. Materials often used include Titanium, HH, H480, H4100, AR236, AR400, AR500, Bullet-proof glass, Mil-A-46100, HY-80, HY-100, and Domex 100XF HSLA. FedTech also has the ability to take care of any paint or finish specifications for defense or military parts as well. FedTech is a trusted source for military and defense manufacturing, we have handled enormous amounts of armor plating for several military and defense operations. If you have any questions about our manufacturing capabilities and facilities, please do not hesitate to ask. 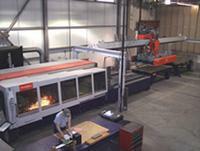 We currently run eleven work cells for waterjet, and two for laser cutting. In addition to these, we also provide machining of all types including: welding, drilling, tapping, forming, finishing, assembly, and more. Of these materials, we're able to help your company develop finished parts for projects such as military vehicles (Humvees, hemit, hummers, M915 and more), information technology pieces and parts, and other related military and defense items used by our troops. Some of Our Large Capacity Machinery. The Bystronic Bystar 4020 is our newest in laser cutting machinery. The Byspeed 3015 provides a fast turnaround on the production floor. This waterjet cutting table is one of our largest, the Wardjet 3013 has the capability to cut even the largest materials up to 12" thick. With these large pieces of laser and waterjet cutting equipment, we're able to provide quick turnaround, competitive pricing, and quality results for our customers. FedTech provides 24 hour priority quoting, e-mail RFQ submittal, and competitive pricing for your laser and waterjet cutting applications. In addition, we offer heavy duty forming and welding capabilities to make purchasing your parts from one source convenient. We are proud of our combination of quality, price and service. Our parts have been used in many industries and are suitable for many applications as well. Contact us for more information and put our laser cutting and waterjet cutting experience to work for you.